LAFAYETTE, La. 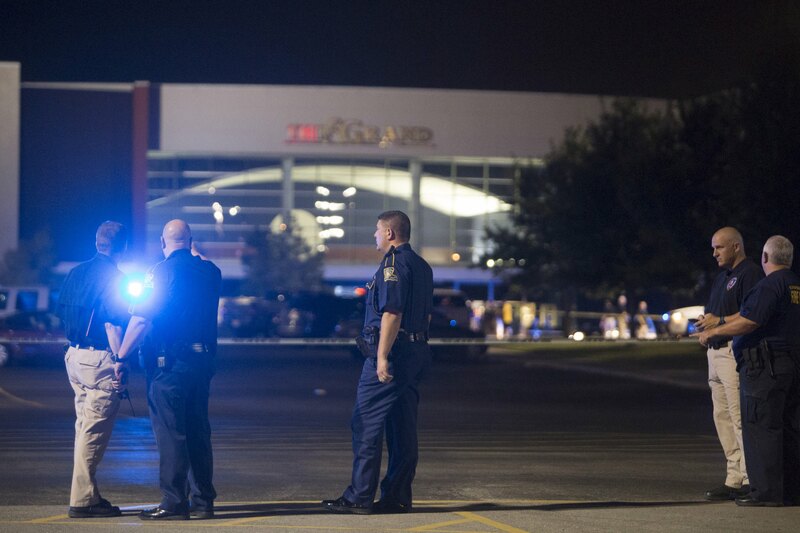 -- Police said three people, including the shooter, were killed Thursday night in a movie theater in Lafayette, La. Two died at the scene, including the gunman, and the third in a hospital, Police Chief Jim Kraft said. Authorities said nine other people were wounded. Craft told reporters the victims' conditions ranged from non-life-threatening to critical. The bodies of the deceased were still in the theater, Craft told reporters in an overnight briefing. He said the first officers arrived at the scene as soon as 30 seconds after getting the call around 7:30 p.m., because they happened to be very nearby. Craft said they encountered patrons racing out, then spotted the gunman and heard one shot. He said it's believed the gunman was sitting by himself, and that the first people he shot were sitting directly in front of him. Eye witnesses told police he stood up early during the showing of the movie Trainwreck" and began shooting. It all happened in the Grand Theater, which is a multiplex. About 100 people were viewing "Trainwreck" when the gunfire broke out. "It was a typical Thursday night in our community until this happened," Lafayette Chief Administrative Officer Dee Stanley told CBSN. The shooter died from a self-inflicted gunshot wound, Craft said. Authorities have determined the gunman's identity but his name was not released. Brooks David, of the Louisiana State Police, told CBS affiliate KLFY the suspect was a 58-year-old white male. Authorities were trying to determine if the suspect knew any of his victims, Craft said. Law enforcement officials believe the gunman acted alone and said there was no ongoing threat to the public. It appears the gunman fired at random, Kraft said. CBS News senior investigative producer Pat Milton cites a law enforcement official as saying the shooter used a handgun. His motive was being investigated. State Police Col. Mike Edmonson said the other screening rooms at the theater were evacuated after the shooting. "We have no reason to believe this individual acted beyond this location here," he said. The movie's star, comedian Amy Schumer, posted on Twitter, "My heart is broken and all my thoughts and prayers are with everyone in Louisiana." The Lafayette police bomb squad was doing a sweep of the theater as a precaution after a dog apparently hit on a backpack and other items raising suspicions, Edmonson told reporters. They also planned to detonate the windows and trunk of the suspect's car, which was located in the theater parking lot, then send in a robot to make sure there were no explosives or booby traps left in the vehicle. State Police EOD (Explosive Ordnance Disposal) and the Lafayette Fire Department remained on-scene overnight conducting safety checks of the theater building, surrounding buildings, as well as vehicles parked in the area. Lafayette police Iivestigators and crime scene technicians were to begin processing the scene once the theatre building, surrounding buildings, and vehicles parked in the area were deemed safe. State Police, the FBI and the Bureau of Alcohol, Tobacco and Firearms were among the agencies assisting local police, according to Craft. "We heard a loud pop we thought was a firecracker," theatergoer Katie Domingue told the Daily Advertiser newspaper. Domingue said she saw "an older white man" standing up and shooting down into the theater, but not in her direction. Domingue told the newspaper she heard about six shots before she and her fiance ran to the nearest exit, leaving behind her shoes and purse. Louisiana Gov. Bobby Jindal rushed to Lafayette after posting to Twitter shortly after the shooting was reported. He said he was "horrified and shocked" by the shooting. "Whenever we hear of these senseless acts of violence, it makes us both furious and sad at the same time," said Jindal, who was in the Louisiana capital of Baton Rouge when he heard of the shooting and came to Lafayette immediately. Congressman Charles W. Boustany, Jr., who represents Lafayette, released a statement Thursday night saying that he was "saddened" by the shooting. "I will work with the Lafayette Police Department, local, state, and federal officials to get to the bottom of what happened tonight," he said. Lafayette is a city of approximately 120,000 people in southwestern Louisiana, about an hour west of Baton Rogue. The shooting takes place just over three years after a theater rampage in Aurora, Colo., in which a lone gunman, James Holmes, opened fire during a midnight screening of "The Dark Knight Rises." Teh shooting killed 12 people and injured 70 others. Last week, Holmes was convicted on each of the 165 charges he faced. On Thursday, jurors reached a verdict in the first phase of sentencing, deciding that the death penalty can be considered. They will now decide whether to sentence Holmes to death or life in prison without the possibility of parole.